KRAFTiBEE is a custom wood sign company that creates one-of-a-kind and personalized wood signs. 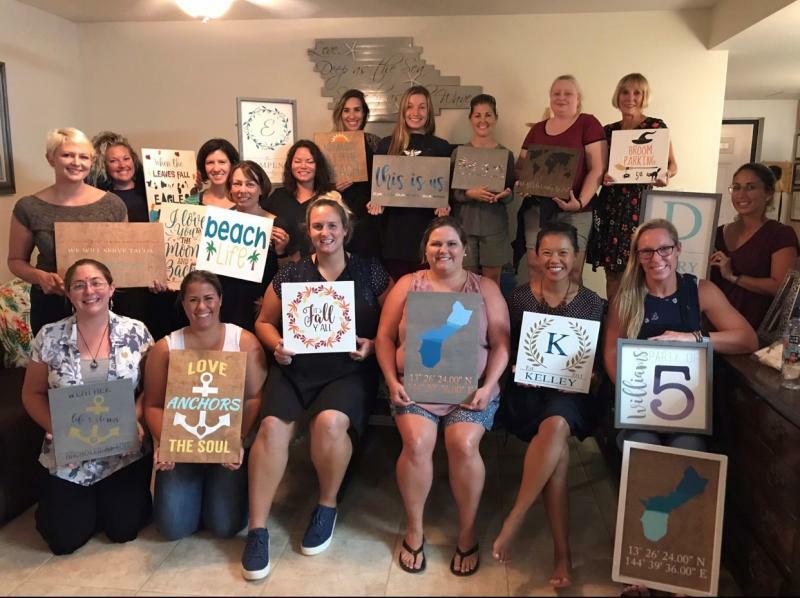 Signs can be purchased as special orders or created during one of our private parties that are social events hosted by a customer whom invites her friends and family to paint together. I started my business in March of 2018. Is Guam where you started your business? Why did you decide to open your own business? We were stationed in Guam previously and once we came back, I knew I wanted to offer something like my crafting business on the island. There is a need for an affordable, creative outlet within our community and I created KRAFTiBEE to be a modern version of a sewing bee. Here, my customers can get together, be social, meet new friends while creating something beautiful to hang on the walls of their home for many years to come. Explain some of the difficulties military spouses have in finding a job and/or starting a business that civilians may not know about. As a spouse, it can sometimes be difficult to take your career with you and start over every three years. Prior to moving back to Guam for a second tour, we were stationed in Yokosuka, Japan, where I worked as an English teacher. I taught Japanese residents English as a second language for the three years we were stationed there. As a military spouse, I always struggled to re-establish myself in the workforce every time we moved. Some employers may hesitate to hire military spouses due to the knowledge of frequent moves that occur, sometimes with little notice. However, military spouses have a unique ability to handle changes and are very adaptable in their roles within the workplace. Starting your own business can be a challenge when you are starting it outside U.S. soil, or on a U.S. Territory such as Guam. Knowing the local regulations, tax laws, and making sure you abide by them can be an obstacle if you are unfamiliar with them or if you are outside of your home state of record. One of my biggest challenges was learning to balance responsibilities at home as a stay-at-home mom and KRAFTiBEE. Finding this balance for myself has been learned through trial and error and a lot of late nights. Another challenge I have faced, is navigating the local business requirements for Guam. I am grateful I have access to the Business College at the University of Guam for guidance on where to start and how to find the requirements and laws. Some of the best advice I would give a fellow spouse on starting their own business is to be fearless. You have to push yourself to move out of your comfort zone in order to truly by fearless and achieve your goals… Also, evaluate the need for your business within your community. Without a need for the service or product you provide your business will never get off the ground.